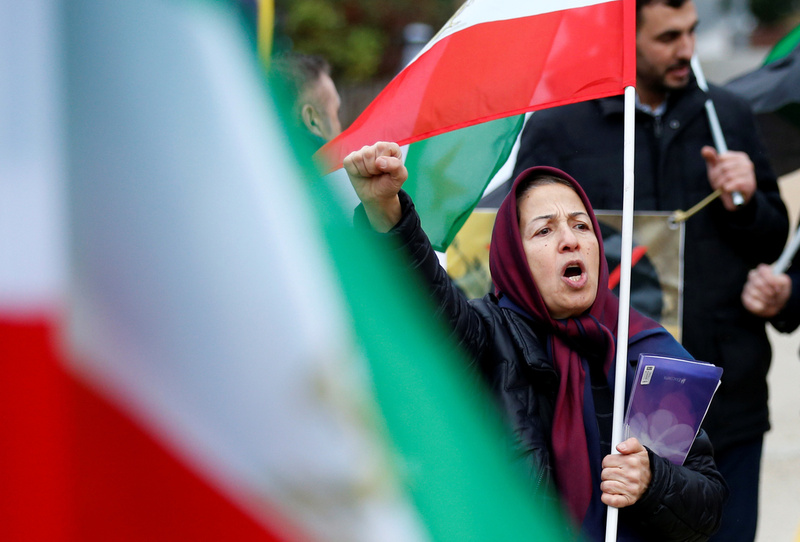 Here's What Makes Iran's Anti-Regime Protests Different This Time : Parallels The scholar Farideh Farhi examines why this fresh round of Iranian unrest is unlike the others. A protester chants slogans against the Iranian government outside the European Union Council in Brussels, Belgium on Wednesday. The protests that began last week in Iran are different from most unrest that has previously roiled the country since its 1979 revolution. They have covered more geography, engulfing small and midsize cities across the country. But they also have reportedly drawn smaller turnouts than the massive 2009 election protests in Tehran. Although more information is needed about the makeup of the demonstrators, significant differences have emerged. Iranian reformists and middle-class residents in large urban areas are reported to have largely steered clear this time around. Economic protests are not rare in Iran. When they occur it's usually in response to a specific government action. For example, Mashhad, the northeastern city where the latest demonstrations began, was rocked by protests and riots in 1992 after authorities tried to demolish homes built without permits in a squatter area on the city's periphery. Several police officers were killed, government buildings destroyed, hundreds were arrested and at least four protesters were executed. Then there was the 1994 protests in Qazvin, northwest Iran. That was triggered when the Iranian parliament's narrowly rejected legislation to create a new province with the city of Qazvin as its capital. But, like in Islamshahr, the structural adjustment policies of then-President Akbar Hashemi Rafsanjani and high inflation were broader underlying factors. Qazvin did become a province a couple of years later. In 1995, protests in the squatter settlements of Islamshahr, on the southwestern outskirts of Tehran, were set off by an increase in public transportation costs. The domestic security forces of the Revolutionary Guard cracked down after protesters took over government and law enforcement buildings. It is not known how many people were killed. The wider spread and simultaneity of the latest protests have led some outside observers, perhaps dreaming of regime change, to overlook key elements. The most significant missing element is the reported lack of a middle-class presence in protests within large urban areas. Many of these folks were key participants in the 2009 protests and, a few years later, instrumental in President Hassan Rouhani's election. The economic and political centrality of cities like Tehran, Tabriz and Isfahan makes their presence critical for a broad-based challenge of central authority. It's not that the many segments of the Iranian middle class are content with current conditions in Iran, the government or regime. Rather, they are ambivalent about the drivers behind the protests and implications for their personal security. Also missing is organizational leadership. This is partly due to the suppression of independent labor and nongovernmental organizations, which could provide conduits for citizens to air their grievances and demands to the government. To be sure, citizens have been encouraged to protest against the regime by certain leaders in exile — at least, until social media platforms such as Telegram were blocked. One of the most vocal advocates is Reza Pahlavi, the Washington-based son of the former shah of Iran. Another is Maryam Rajavi, the Saudi-funded, Paris-based head of a controversial Iranian resistance group called Mujahedeen-e-Khalq. But the latter is loathed inside Iran way more than the regime, and the former has failed to create and lead a viable and unified opposition outside of Iran. In any case, as a recent Iranian joke put it, "Iran already has one shah!" Because the call for wholesale regime change largely comes from the outside, and without any linkages to the struggle for reform inside Iran, the country's reformist movement has distanced itself from the protests rather than try to give them direction and organization. None of the above is to suggest the demonstrations are without impact. The protests came suddenly and are a reminder of how quickly Iranian protests can get out of control, turn into international events and challenge the legitimacy of the whole national system. Unless the country's divided and discordant leadership can reach a consensus on changing the ways of the Islamic Republic, allowing independent organizations to form and effectively articulate the demands of the variegated society, Iran's leaders will be playing with fire, endangering the country's stability and security. It really doesn't matter if these protests are encouraged by "enemies of Iran," as Ayatollah Ali Khamenei suggested this week. The responsibility that encouragements to take to the streets succeeded inside Iran falls squarely on the shoulders of the Islamic Republic. Farideh Farhi is an independent scholar and affiliate graduate faculty at the University of Hawai'i at Manoa.